JERUSALEM (CNN) -- Secretary of State Condoleezza Rice on Saturday said Israel's plans to build 1,300 homes in East Jerusalem were "simply not helpful" to peace efforts in the region. 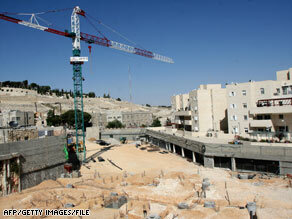 Israel is under pressure to dismantle East Jerusalem outposts like this one in Maaleh Hazeitim, seen in April. Israel announced plans for the settlement Friday, bringing the total homes planned in the area to more than 3,000. The Palestinians hope to make East Jerusalem the capital of a future Palestinian state. In a statement she made before her meeting with Israeli Foreign Minister Tzipi Livni in Jerusalem, Rice said she would raise the issue of settlements. "I'm very concerned that at a time when we need to build confidence between the parties, the continued building and the settlement activity has the potential to harm the negotiations going forward," she said. "We've said before that this is a time to try and build confidence, and this is simply not helpful to building confidence," Rice said on a plane trip to Tel Aviv from Paris, where she took part in a conference on aid to Afghanistan. "It will certainly be a topic of conversation, and I expect to raise it with all of Israel's officials and leaders." Rice plans to meet with leaders in Jerusalem and the West Bank city of Ramallah this week on the progress of U.S.-backed plans that eventually could lead to the creation of a Palestinian state. Earlier this month, the White House and U.N. Secretary-General Ban Ki-moon criticized an Israeli plan to build an 800-home settlement in East Jerusalem. And in March, officials in Jerusalem announced another 600-home settlement as part of an initiative to add 40,000 homes to the city. Rice said Israel's settlement plans in the area prove that the process of creating clear and universally recognized boundaries in the region is important. "It gives us every reason that we really ought to be determining the boundaries of the state, because what's in Israel will be in Israel, at that point, and what's in Palestine will be in Palestine," she said. "We've talked a great deal about road map obligations, and this one isn't being met." As part of a 2003 "road map" peace agreement, Israel agreed not to build on disputed lands. Israel says it's not violating the agreement because most of the settlement would be on land it has already annexed.